The model 438USA-INT (Universal Switch Adjustable Interval Time Capsule) is an all Solid State timer provide Internal timing control of any load device operating from 24 to 240V AC. 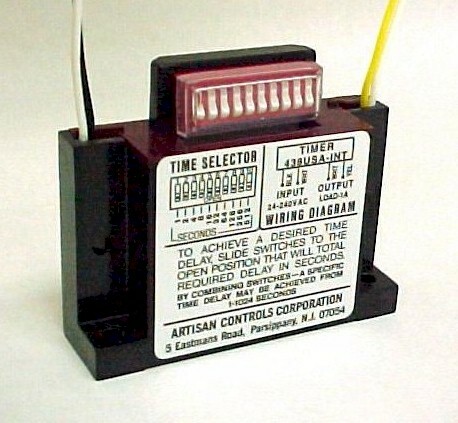 Timing is set via a binary coded dip switch and is adjustable from 1 to 1024 seconds. When power s applied, the 438USA-INT turns On permitting full load current to flow. At the end of the preset timing period the 438USA-INT turns Off and permits only leakage current to flow. Operating Voltage 24 to 240 Volts AC 50/60 Hz. Timing Mode Interval, external load energizes when operating voltage is applied and turns OFF after preset timing period as set by 10 DIP switches. Timing Tolerance ±10%, or 1 second whichever is greater. Repeatability Of Timing Periods ±1% nominal. Output Rating 10 mA to 1A inductive with inrush current to 25A for 8 milliseconds. Output Voltage Drop in ON state 4 volt maximum during an interval timing cycle. Terminations Four (4) #20 AWG wire six (6) inches long, Two (2) for operating voltage and two (2) for load circuit.